When we first saw this store sitting in the old Games Workshop premises on Lands Lane, the team at Leeds Love Affair emitted a small squeal of delight. Who on this planet doesn’t get excited by a sweet shop?! The long overdue refurbishment of a key unit on one of Leeds’ busiest shopping streets has given it an eye-catching and distinctive look, but the vast array of sugary treats within is what makes it hard to ignore. It would be easy enough to say this is a place to ‘relive your childhood’ (which it definitely is! ), but the great thing about Candy Hero is that it allows you to explore and try other sweets from around the globe. By all means grab a Wham Bar, or even a packet or Nerds, but why not try something different? How about something from Scandinavia? Or an American candy bar you’ve seen in your favourite films (think Chunk and Sloth bonding over a ‘Baby Ruth’ in The Goonies)? Then there’s the chance to wash it down with a hot chocolate from the extensive menu, or even something quirky from the fridge. A Tab Cola perhaps? We are Candy Hero, a unique, imported candy retailer with a fun, sugar-laden shop on Lands Lane. We were founded in 2008 by brothers Frank and Leo and began life selling a small and unique range of energy candy online. As demand increased the range was expanded to include popular American candy, then Finnish candy, shortly followed by Swedish candy. By mid 2012 Candy Hero had moved premises four times to warehouse the ever-expanding product range and in August 2012 we finally got the keys for our first ever shop in the heart of Leeds city centre on Lands Lane. Since the shop has opened, the range of products we stock has continued to grow, currently totalling 1500+. 2013 brings new shop openings in Bradford and York, a new website and lots of lovely new staff. The future is looking sugary! What do you think makes Candy Hero unique? 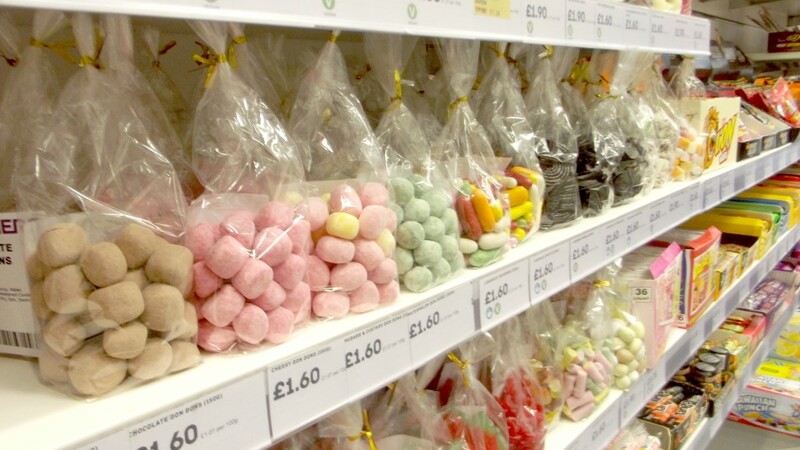 We give the personal and friendly service of the traditional British sweet shop alongside the energy, vibrancy and choice of a modern candy importer. A humongous range of unique candy imported from around the world, knowledgeable staff who can help you find ways to tantalise your taste buds in a way you never knew possible and competitive prices which you can afford. A Rocky Road Hot Chocolate (2.20) with a Pulsin’ Berry Burst Bar (1.60) is a great pick me up on a long day. Somehow the amazing antioxidant properties of the berry bar neutralise the calories in the hot chocolate – it’s like magic! We have an up to date list displaying our bestsellers on our website. Currently topping the charts we have Reese’s Mini Peanut Butter Cups. Leeds just can’t get enough Peanut butter in their lives, they’re mad for it! There’s not just one thing that makes Leeds special but a whole host of things which make it a place we feel proud to live in. Our top three reasons to love Leeds would be: the great range of well-recognised chain stores alongside fresh and unique independents, Kirkgate market (the largest indoor market in Europe!) and the canal which takes cyclist right into the city centre or out of it depending on your mood! Red’s BBQ to fill us up, Outlaw’s Yacht Club to lighten us up and Smokestack to loosen us up! Images courtesy of Stan Owen.